No matter which application (LAN cables, power cables etc. ), drawing of wire rod is the starting step of the wire production. Our rod breakdown lines for copper, aluminum and relative alloys are designed and produced in order to satisfy the challenging needs of the industry as having a thinner wire diameters, flexibility and high tensile strength. All our machines are designed and manufactured tailored on clients and industry needs. 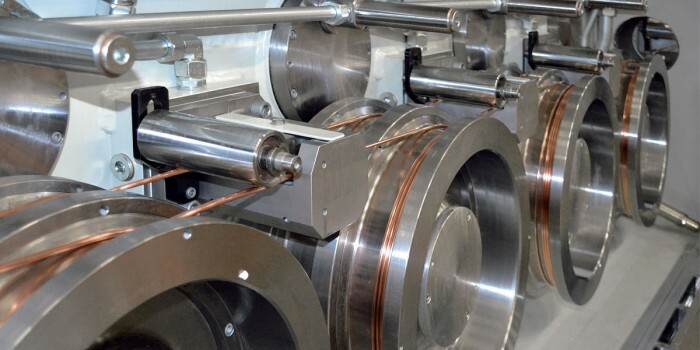 Our horizontal annealer solutions ensure a close control with maximum power factor. The AN series feature an especially long pre-heating path for copper and aluminum wire treatment. Separate drives on each axis avoid any interference with the annealing process. Three large 600 mm diameter rings increase the contact surface with the wire, eliminating potential power sparks to increase the life of the contact bands. Annealing rings are easily replaced with convenient access for maintenance. All electro valves are directly controlled by the line supervision system.